After spending a whole day out and about, there's nothing better than coming back home and spending some time lazying around in a cozy bedroom. My bedroom may not be 'designer' or anything really, but to me, it's the coziest place where I can go to read, study or just relax and spend some time alone. And that is the most important thing about a bedroom. It has to fit you and no one else. 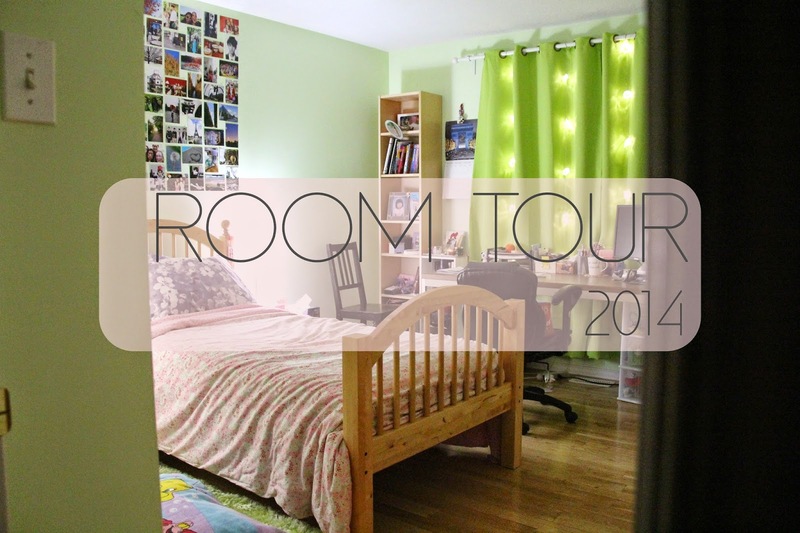 So here's a little look into my room, my quirky little haven. 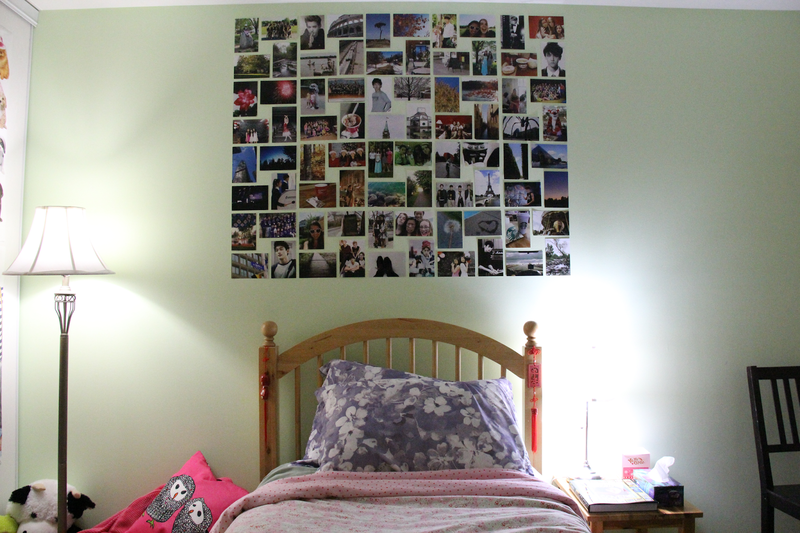 When you climb the stairs to the second floor, if my bedroom door is open, you will most definitely be greeted with the sight of my newly put up photo wall. I'm kind of in love with being able to display everything I love on one wall, from my photography, to my family and friends... and I even went as far as to print out a couple of photos of my favourite celebrities! I'm hoping that one day I'll be able to cover my entire wall with things I love which make me happy! 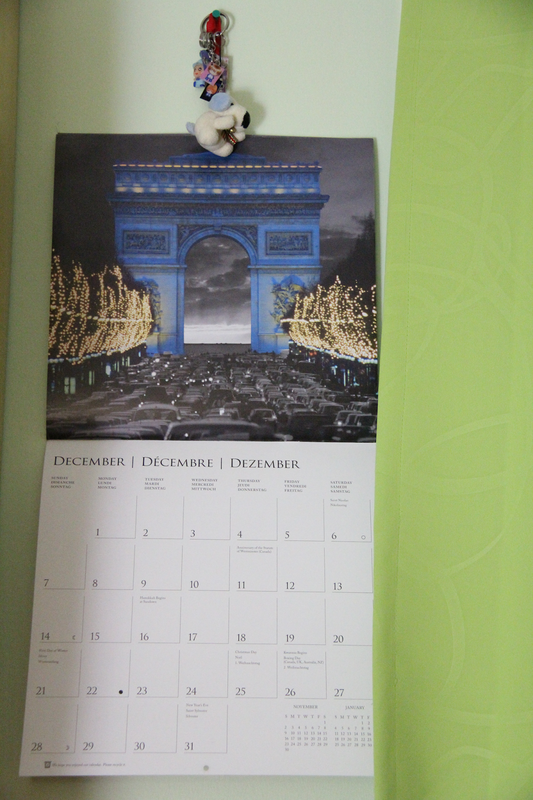 And yes, the walls are green. I've received many mixed reviews about my choice in colour, however no matter how others may not like my wall colour, I chose it since green is my favourite colour. I love how this light green can make you feel just a little more at ease and relaxed while other colours are known for giving energy or really tiring you out. Plus, I've always been a big fan of everything nature, which is perfect since I live in Canada, but green tends to be a colour that represents that well. 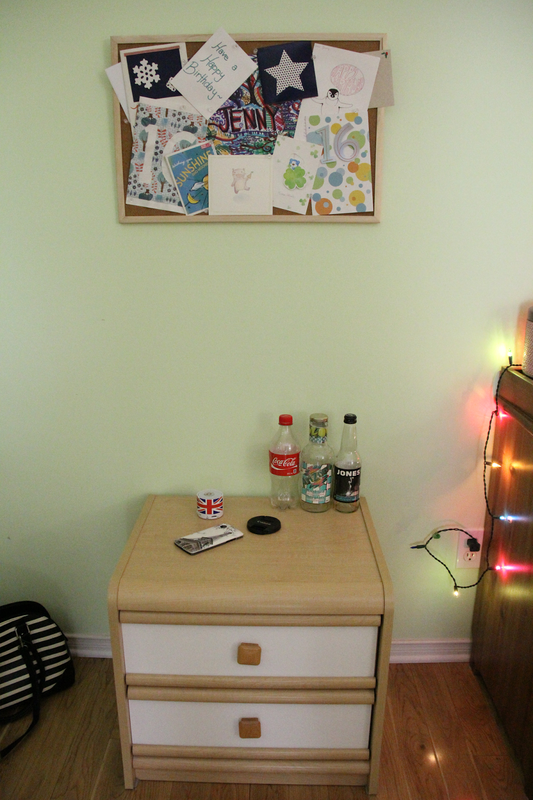 On the left of my bed is one of my favourite spots in my room. After years of hoping for a bean bag chair, my dream finally came true last year. 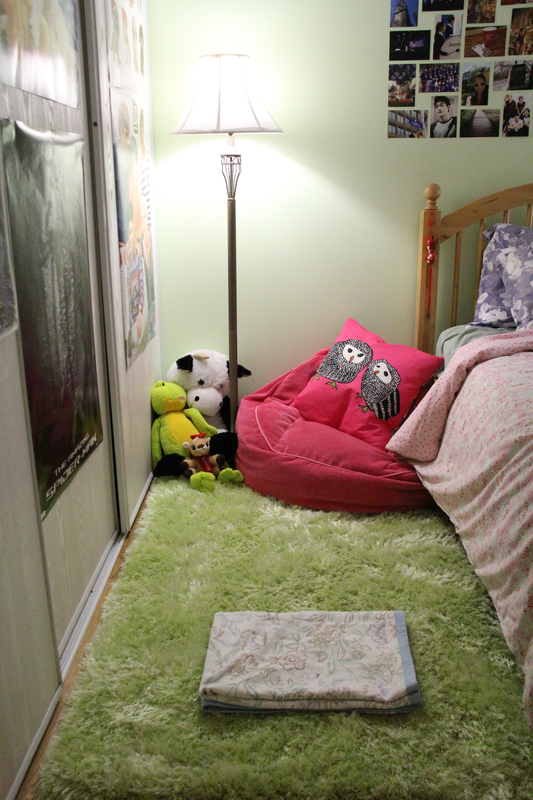 This corner with the comfy chair, stuffed animals and my childhood "Blankie" is my go-to spot for some relaxation. That means those few moments every month where I leave all my homework on my desk and cuddle up for an hour to go through what has built up on my YouTube subscriptions list or to read a book. 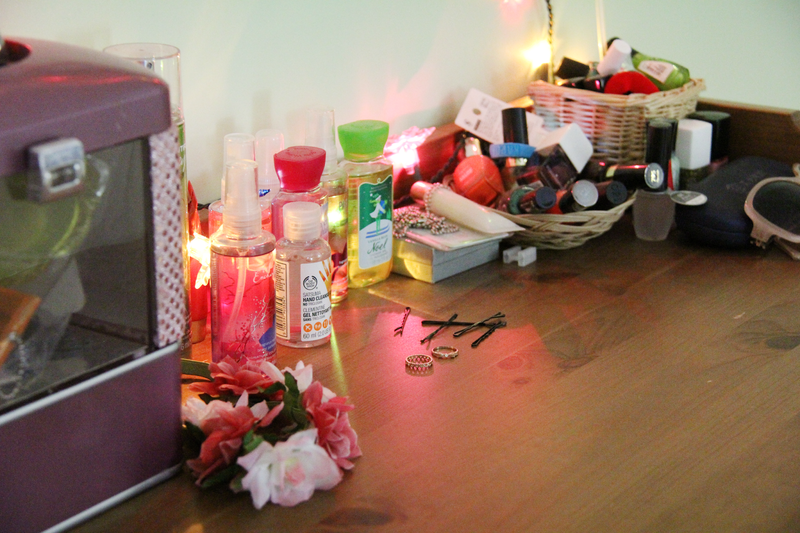 On the other side of my bed is a little bedside table that I have. 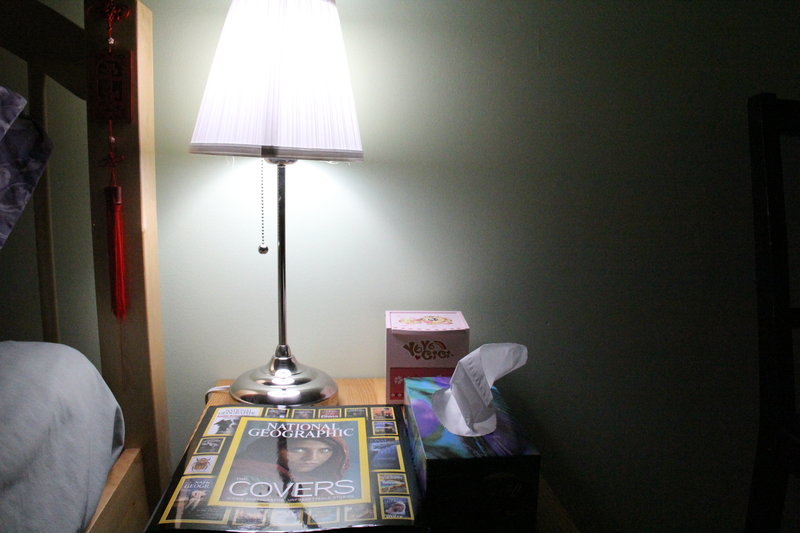 All it holds is my little box for my bracelets, a tissue box, my lamp and my new favourite book. My mom bought me National Geographic Covers for my birthday knowing how much I love photography. I'm going to start reading it during break and I cannot wait to flip through all those beautiful photos and stories! Directly on the left of my bed is my desk. 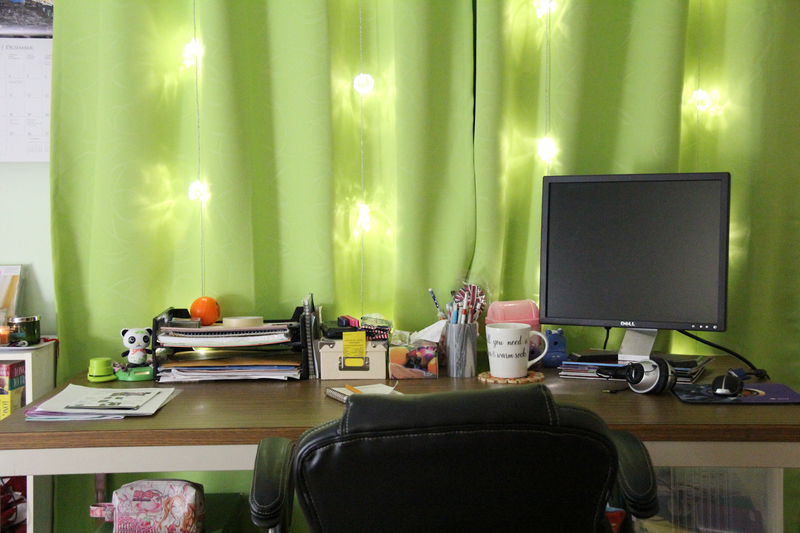 The home to my school work and blog posts. I actually have a specific post dedicated to the way I organize my desk here if you're interested. On the other side of my bed is the perfect representation of the poster and fangirl/boy phase every teenager goes through. If you get to know me, you'll find out I'm a hoarder. I find it difficult to throw away anything since I can always think of a little memory the object holds. 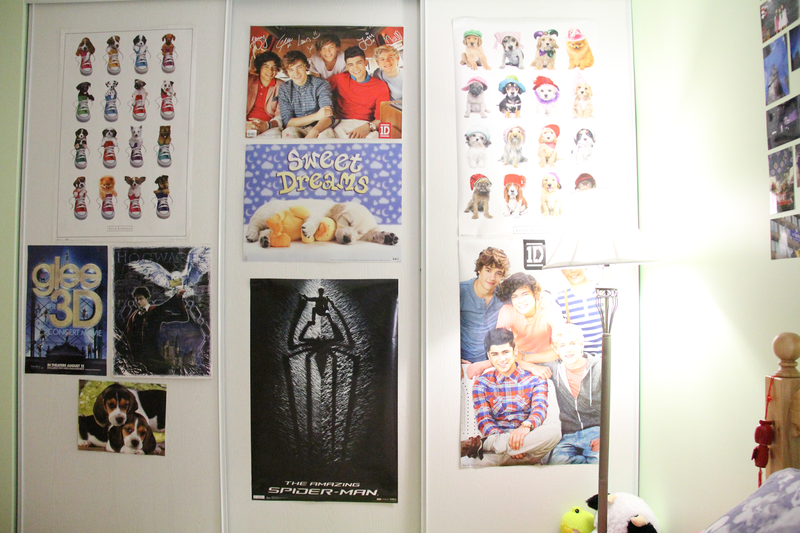 So after taking down the posters to put up my photo wall, I slapped them all onto my closet doors and they will probably stay there as a little nostalgic tribute to my cheesy fangirling days. At the very foot of my bed is a dresser that I've had for as long as I can remember. In it, I store any clothes that does not need to be hung up. On the top, I like to keep by huge collection of body mists and lotions from Bath & Body Works, my nail polish collection and other miscellaneous accessories that I've been too lazy to properly put away. 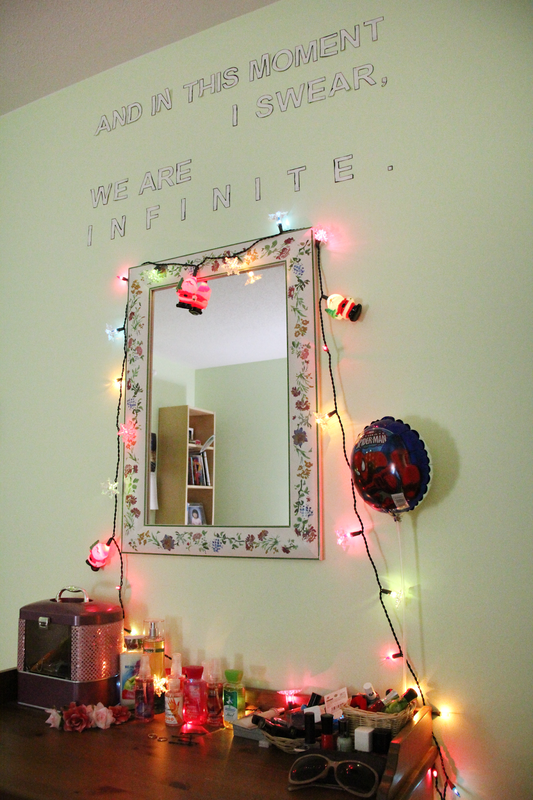 I'm also kind of in love with the Christmas lights I have strung around my floral mirror. They're actually there all year round, but the little snowflake accessories only come out in the winter and the Santa's, around Christmas time. And though all this already makes me very excited (I'm weird, I know), my most favourite thing is the quote on top of my mirror. "And in this moment, I swear we are infinite." As mainstream hipster as this quote is, I read The Perks of Being a Wallflower in grade 8 upon the recommendation from my friend Rosie. This was before the book really became popular, but I truly believe that since I read the book as a middle schooler, it was that point where every event had an effect on my life. And I believe that this book contributed immensely in shaping who I am today.